Further to my previous work on attempting to bring together our multiple datasets into a synthesis (1)(2) and on visualising the results (3), I have now performed a more extensive test of the methodology using all of the data that we have gathered to date for English Heritage’s West Midlands region. To briefly summarise previous posts, my synthesis methodology consists of creating a tessellation of 1km by 1km grid squares across England, with the SW origin point of each cell being 50m west and 50m south of the 1000m divisions in the OS grid. We simplify the terminology used in each of our input datasets, run a series of identity queries in ArcGIS to define which cell(s) each object is located in, then collate the data for each cell for all datasets to create a new single synthesis layer. We can then test these results against various measures such as mean elevation, mean terrain ruggedness index, percentage ground obscuration etc. Bronze Age sites as collated by David Yates (2007. Land, power and prestige: Bronze Age field systems in southern England. Oxford: Oxbow). Janice Kinory’s database of Iron Age salt processing sites. A layer showing field systems recorded in the AIP database. A layer showing settlements recorded in the AIP database. English Heritage National Record of the Historic Environment data (NRHE). 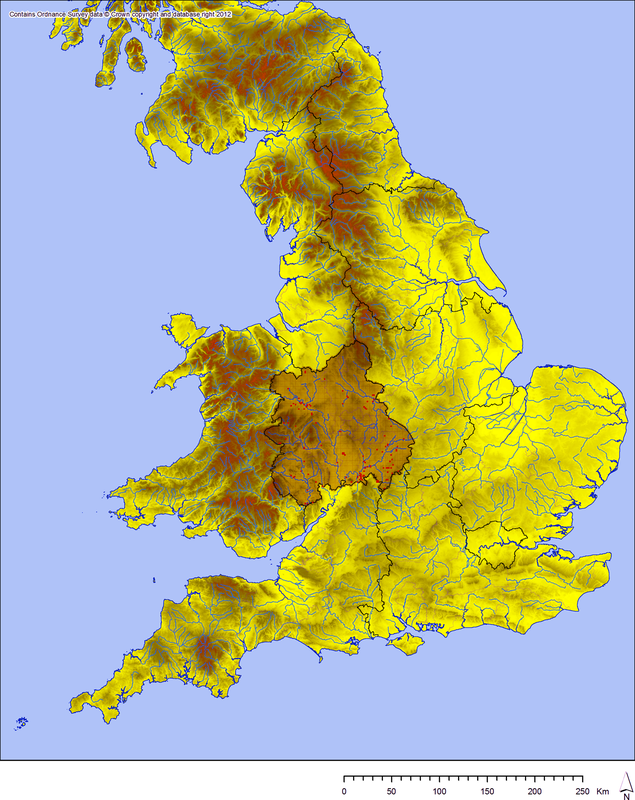 English Heritage MORPH data (for the Marches region). HER data from Birmingham, the Black Country, Coventry, Dudley, Herefordshire, Sandwell, Shropshire, Solihull, Staffordshire, Warwickshire, and Worcestershire (Worcester, Stoke-on-Trent, and Dudley are not yet in our database, although we have the data for each, so it was not possible to include them in the test). 1km x 1km grid cells showing evidence of sites within the ‘Domestic & Civil’ category; unspecified prehistoric. 1km x 1km grid cells showing evidence of sites within the ‘Domestic & Civil’ category; Bronze Age. 1km x 1km grid cells showing evidence of sites within the ‘Domestic & Civil’ category; Iron Age. 1km x 1km grid cells showing evidence of sites within the ‘Domestic & Civil’ category; Roman. 1km x 1km grid cells showing evidence of sites within the ‘Domestic & Civil’ category; early medieval. These results show several patterns. Settlement can be seen to follow the major river valleys in many cases, especially along the Warwickshire Avon. In the Iron Age, there is a distinct move towards upland settlement in addition, especially in the Marches. Roman settlement is most dominant in the south east of the region (Warwickshire and Worcestershire). The cluster of settlement seen in all but the early medieval in the south of the region is in the vicinity of Bredon Hill, which was clearly an important area through the later prehistoric and into the Roman period. The early medieval distribution is particularly interesting due to the large number of sites seen in western Staffordshire: these are largely records of manor sites. It seem likely that this is an artifact of data collection, perhaps resulting from a particular researcher or HER officer having a particular research interest in Staffordshire manors (it seems likely that these originated from Domesday records?). South east to north west banding for analytical purposes. 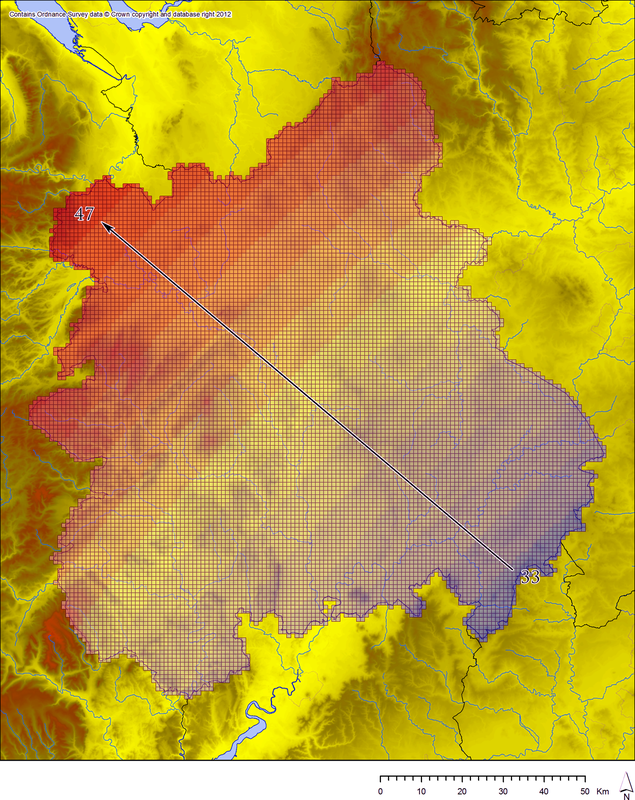 Elevation of grid cells showing evidence of sites within the ‘Domestic & Civil’ category, grouped by band and coloured by period. This graph shows that settlement generally occurred in areas of lower elevation, with most upland occupation being Iron Age in date. The dominance of Roman data in the (left-hand) south eastern bands is obvious, as is the dominance of early medieval data in bands 40-42 in particular. 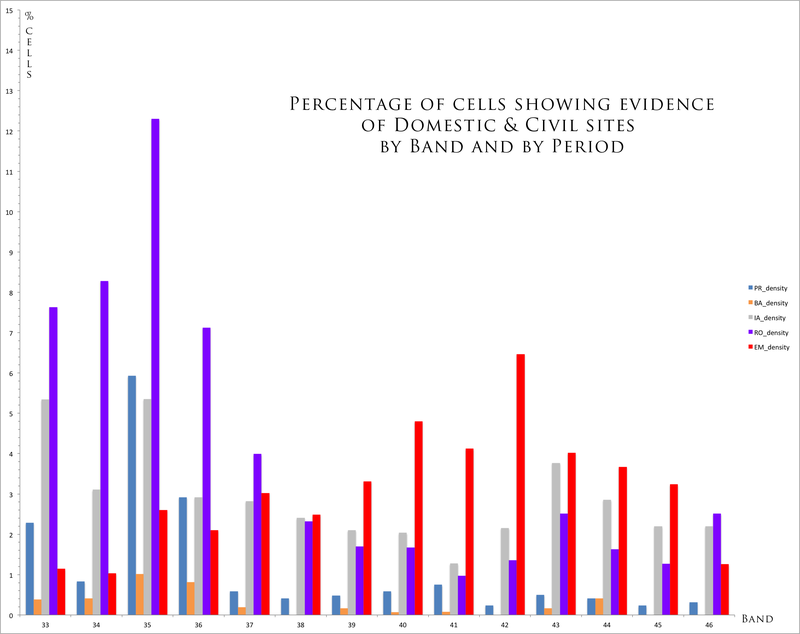 Percentage of cells in each band showing evidence of sites within the ‘Domestic & Civil’ category, coloured by period. 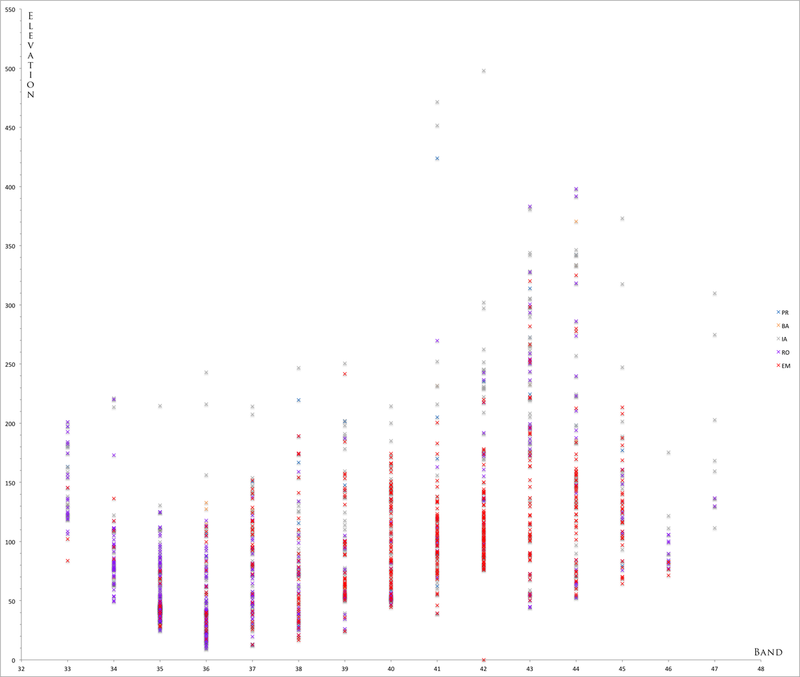 This second graph works better, showing the high levels of Roman occupation in bands 33-37, and relatively high levels of early medieval occupation through bands 39-45. Band 35 contains most of the Warwickshire Avon, providing supporting evidence for my earlier suggestion of its importance based upon visual examination of the map. 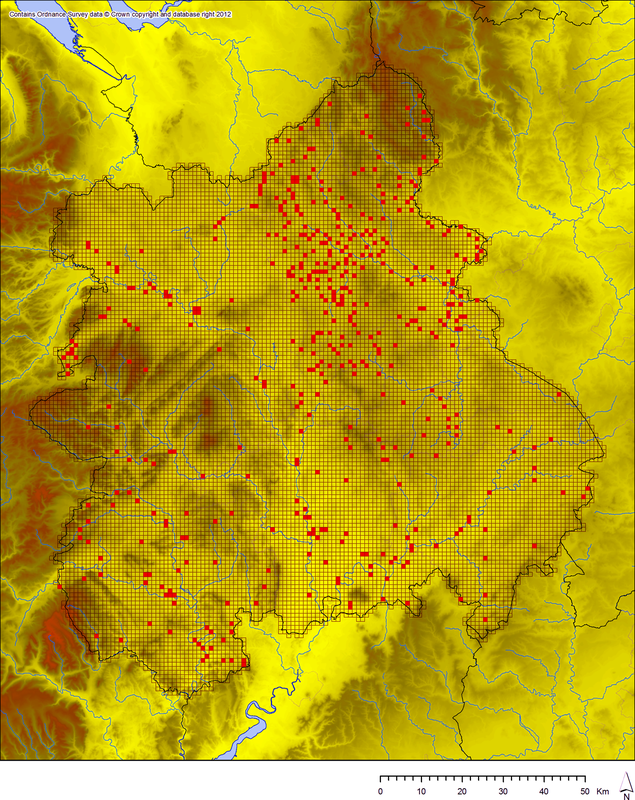 1km x 1km grid cells showing evidence of Roman villas (West Midlands only but scaled to show all of England). This is just the latest test of my synthesis methodology, but I do think it is proving to be a productive and informative way in which to bring together such a large variety of different datasets into a single analytical environment. The distributions and graphs shown above are just examples of data that we could map. We could also map any of our other thesaurus categories or specific thesaurus terms, and we could easily perform analyses against other variables beyond elevation (e.g. terrain ruggedness, ground obscuration etc.) and using other bandings or groupings of cells. Once we have all data collated for England, I will test the system again with all of that data and see how it works. Only time will tell. EDIT 09/10/12: Updated second graph to correct mathematical error.